Who is Meg Fowler’s hero? 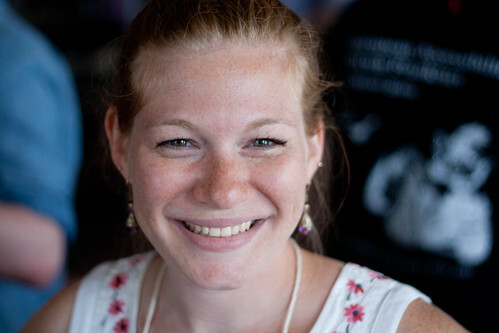 Meg Fowler is a freelance writer and editor for print and the web, for corporate and independent clients. She is also the co-organizer, fundraiser, copywriter for Social Media for Social Change (SM4SC), an organization that leverages the power of social media to raise awareness for worthy causes. Follow her on Twitter @megfowler. I “met” both Matthew and Gradon on Twitter in earlyish ’08. I met them both properly in October ’08, though I met Gradon first when he came to get me at Logan. I was in Boston for the very first SM4SC event, as far as anyone else really knew at that point. Of course, I was also completely gonzo for Gradon. That was a nice side benefit to the trip. Well, before SM4SC was ever even a thing, Matt and Gradon were both fabulous friends to me over email/chat, all the way from NYC and Boston, respectively. After Gradon came up with the idea for Social Media for Social Change in Summer ’08, we joined forces to make it a reality (along with PR dynamo Rebecca Corliss and the amazing community that developed around the vision.) At that point, I think our relationships became cast in stone. I have been continually impressed, amazed and moved by the effort and passion these two have put into this cause ever since. Both Matt and Gradon have a desire to see social media tools used for something more than just sharing links and celebrating Apple product launches. They believe that nonprofits of all stripes can use these platforms to facilitate greater awareness of issues, grow their communities, and raise funds more effectively — and change the world in the process. At this point, SM4SC has held two major events in Boston and NYC, along with several smaller events in NYC, and a couple online giving initiatives. We’ve got SocialChangeCamp coming up this fall, too, and a zillion other plans. I can’t believe how wonderfully all of it has turned out. And beyond all that good stuff, Gradon and I had a connection that turned into love in the months before we met. I was so nervous to meet him for the first time that day at Logan, even though we’d spent enough money on phone calls to keep Canadian telecom executives in yachts for years. But within five minutes, we knew we’d made the right choice. Now — with several more visits back and forth, of course — we’re making plans for me to move in January to Boston to be with him permanently. I’d say all of that is pretty profound. Matt comes to the table with an incredible knowledge of technology/social media tools/marketing/branding, as well as a tremendous ability to foster community. He’s the guy everyone knows and loves, but he backs up that ability to connect with a crazy brain that never stops working. I am continually inspired by his passion for SM4SC, for people, and for doing good things in his community — and any other community, really. He’s also my go-to problem solver. Matt knows more stuff about stuff on his worst day than I’ve managed to pick up in years. Gradon is also a connector — he gets people excited to be a part of things, and can relate to pretty much anyone. He’s fantastic with social media tools, but I think his most important skill is his ability to make people feel heard and understood — something that comes in remarkably handy when you’re dealing in the non-profit sphere. Beyond that, he is in love with design and music like few other people I have ever met. You can’t help but get excited about the sights and sounds of the world around you when you’re experiencing them along with him. Gotta quote Matt here: “People first, everything else second.” Could there be a better way to live? Thank you Meg for sharing your heroes with us!